I started this journey 4 years ago, when I went as a junior in high school but it didn't work out and I never really mentioned it to anyone until now. The next year after I graduated I decided to try it again and went with Snell Harvesting. Most of you know the long story there. If not, the short version was I didn't get along with the crew or the way it was run and had an incident in which I resigned my position. The next two years I went with Danielski Harvesting. I want to start off by saying they are the best crew I worked for and one of the best crews around period. Not only do they take care of their employees but they are very understanding of the harvest and it's up and downs. It's not every day you get to drive a brand new combine, brand new header, unload into very new grain carts pulled by brand new tractors and watch them unload into very new Peterbilt semis. Tom, the harvesting manager is a great guy. If you ever need an advance he's the guy to ask, he gives the most... He never gets hot headed and if he does you deserve it I guarantee it. Don, Tom's brother a crew boss is a good guy, he's not mad he just always sounds like it, do as you're told and you'll have no problems. He's a perfectionist and expects nothing less so try your best and you'll be okay. Luke, the hard worker of the crew. Sure he likes to run long hours and work hard but when he tells you something you can count on it. He told me I'd be home by the first of August and I was, as promised. Aaron, another crew boss is a good guy to work for, pretty laid back most of the time but can get riled up. I cannot begin to express just how good of a crew Danielski's are and the experiences I have gotten from these last two runs. They give you a bonus even if you're just summer help. It may not be all that big, but at least they treat you with the respect and dignity you deserve. They run a top notch operation from the Farming side of it, to the Harvesting, to the newly acquired Fuel trucking business. Most people cut corners to make the business work; these guys spend the money to get it done right the first time. They value their image. I was proud to say I worked for Danielski farms in my time there. When you're on their crew you're part of them not just an individual working with others but rather as a whole crew. You go everywhere together and do a lot of things together which really helps include everyone. I felt at home from day one when they explained how it was done on the crew to the other day when I said goodbye for what I expect to be the last time. If anyone has any questions about myself, my harvest runs, or anything in between please feel free to email me at alexryan86@hotmail.com. I guess to conclude this whole long drawn out goodbye and wrap up I must say that I have enjoyed the last two harvest seasons and I wish to thank everyone at Danielski Farms/Harvesting for everything they have done for me and given me as far as opportunities. I will still be around my website and can be reached at the above means whenever. We got up this morning and headed back to Valentine with the grain cart and the service truck pulling a grain trailer. When we got to Valentine we unloaded the cart and blew off all the chaff and gave it a once over with the pressure washer. In the afternoon my brother and girlfriend came and picked me up thus ending my harvest run for the year. I arrived home around 9:00pm. Headed to Hemingford this morning to finish our 70 acres left. We cut a half pivot of white wheat and it was the best irrigated we cut this year in Hemingford. We finished about 6:00pm and got the combines and headers ready to be picked up next week. Had a complete day off, which was nice for a change to just lie around, enjoy life, and catch up on sleep. Went and loaded 2 combines headed for ND this morning at 7:00am. We then went tubing down the river. That lasted all afternoon. We finished washing the one combine and washed and blew off the other one. I rebuilt the hitch on one of the single header trailers with my crew boss in the morning and then in the afternoon we put the hitch back together and washed the other combine and the boss's pickup. So tomorrow morning we'll go to work at 7am and load the two combines and headers and then probably go float the river in the afternoon with the crew. After figuring out what we were going to do we decided to load up and head to valentine for the next few days. It rained over 2 inches in the last shower. So we got to Valentine and unloaded the two machines that will be sent to North Dakota with the other crew. We got one blown off and partially washed and the other one ready to be blown off and the headers washed. Only about 500 acres left... so we started the day about 9:00am and started rolling and never looked back. Throughout the day the chance of rain went up from 20% to 40% and so that meant there's still a 60% chance it won't. I was wrong, about 6:30 and with only 70 acres left we got hit with rain, hail and high winds. So that was it for that day. Today just got started and cut about 100 yards in and heard a loud pop/explosion noise over the radio and AC in the cab.... looked back through the grain tank window to see black smoke billowing from the exhaust and noticed an extreme loss of power and after further inspection the turbo had blown up. After calling around for over an hour, the only one in the area (500 miles) was in Ogallala about 2.5 hours one way to get the turbo. So I left about 1:30pm and went and got it. When I returned with it the John Deere tech had the old one off and was ready for the new one, when we left the field about 9:30pm he was just programming the new turbo up to specs so it would be like new. I'll know tomorrow how much better it runs compared to the rest of the year. Only around 500 acres left so we could be done tomorrow and if not tomorrow early Thursday by the time we get done. Since last Tuesday 7-18 not much has happened. JD came out and worked on my combine only to discover nothing, so I changed the fuel filters and kept sampling the wheat. It finally dropped from 18% to 16% two days ago and 14% yesterday and finally down to 12% today and got the water and green out of the straw. We are going to try and get rolling tomorrow with all 4 combines on the 800 acres of irrigated tomorrow. Today was the day to try our hand at the irrigated and after the last few days of 100+ degree heat it should have been ready but the 2.5" of rain last week wasn't very forgiving. The first pivot we sampled was over 17% with a lot of sucker heads. The next pivot was more of the same. The heads haven't even curled up yet even under the extreme heat so it's a few days off yet. The straw is still almost completely green at the base so we'll wait a few days and try again. Tomorrow John Deere is coming to look at my combine (#7) as it smokes like an old Gleaner with the Deutz motor in it. We've tried everything and it still smokes. It also overheats according to the corner post but if you run with the temperature maxed out for 45 seconds to 1 minute the temperature will suddenly fall back down to 2 or 3 bars (12-15 bars is max I think). It's seems pretty power short. I know you're thinking fuel lines, filters, sensor on fuel pump, nope... changed all of those and still no luck so John Deere gets to see if they can figure it out. I'm going to change oil on the combine just got here from the other crew as it is due. The rest of the crew left for Valentine to go home for a while since there is nothing really to do here. They all live either in Valentine or near so I was the only one not from the area so I stayed in Alliance to check on the wheat and sample it just do general maintenance. It's been well over 100 degrees the past few days. Moistures went from over 13% to 8% and under at times. The test weights have ranged from 59.9lbs - 61.5lbs. Protein from 9.5% - 11.5%. We've covered a lot of ground with our 4 machines. We got our crew's 4th machine back from another crew to help us cover ground for a farmer who wants things done ASAP and it's a job nobody would want to lose so we got rolling. The wheat's averaged from 25ish-50ish on the dry land. On the 17th we finished up our dry land, we covered almost 700 acres including a 5+ mile move and long elevator lines and long hauls to get there. The 16th we cut over 600 acres so we were "making money" until we paid the expenses but that's the business. Today... got started about 11:00am and cut a quarter (160 acres) and right as we cleaned up the corners and starting cleaning out on the cart the rain let loose, so we're done for today again... story of the harvest of '07 RAIN... and late starts. Yesterday we cut probably 450 acres in our first "full" day of cutting (actually a couple hours short) we covered some good ground here. Ran until 11:15pm due to the threat of rain. Went to the field around 11:00am and took several samples started at 15.2% for the first two then dropped to 13.7% at 5:00pm so we got started and cut close to 200 acres of good standing wheat 30-65bpa and 58-60lbs test weight. Afternoon Update: Another .1" of rain and 80 degree weather don't dry wheat down so it looks like another afternoon of relaxing at the motel. Another shower in Hemingford last night will slow us down until at least after dinner again today. So I'll let you know how it turns out after dinner. Tried it again today after fueling, blowing filters, changing oil, and putting the headers on. First couple samples were in the 16.5 and up range the last sample was around 16.1% and hasn't changed much from Saturday the locals are telling us. The heads are still standing up not curled over so it could be a few days barring any more rain and cool weather which we seem to bring with us everywhere we go. So for another round, Alex. Got moved to Hemingford, got everything unloaded and then the sky did so as well. It was raining/heavy sprinkle when we left the field. We'll change oil and grease in the morning. Looks like another late start. I spoke with Alex this morning. He said they loaded all the machines up this morning and were driving to Hemingford, NE. 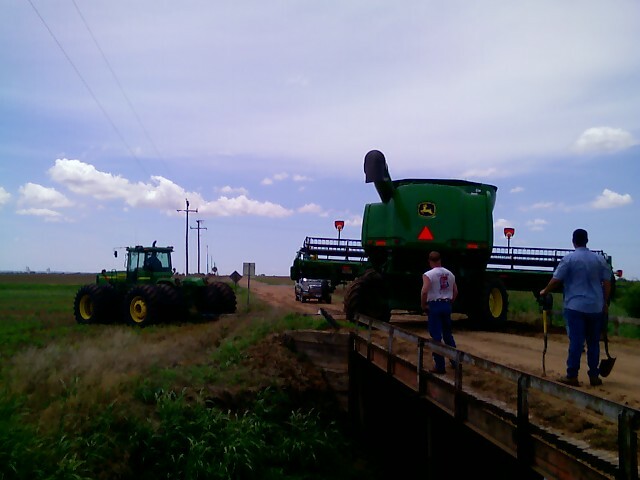 They are taking 3 machines, 3 are in Chappell, KS, 6 are at the King ranch in TX for Milo, but it has been wet there. There are also 3 more machines at the home farm in Valentine, NE. The guys in Chappell have been cutting like crazy, since the wheat there is running about 9.5% moisture and 65-80 Bu/Ac. Also, it seems there aren't any other custom cutters in that area, so they've got plenty of work if they can get to it. Alex said there is still a lot of standing wheat around the Pratt and Greensburg, KS area, but it has such a low test weight there that most of it will probably not be cut at this point. I talked to Alex this morning via phone in Dodge City, KS. He hasn�t had any Internet access for a while, but he has a lot of pictures that he is going to be uploading to facebook in the near future. It rained yesterday, and today it is overcast and cloudy. The guys were catching up on sleep, doing laundry, etc. They have been fighting moisture issue every morning lately too. They don�t usually get started until noon, with the earliest being 10:30AM. The wheat gets down to 11% moisture by mid afternoon, and creeps back up into the 13% range by dark. He figured they were about half done with their expected acres in the area, and so far it has been yielding between 45 and 60 Bu/Ac. They are running 4 machines here. Next week some of the other machines will be heading south back to TX to start on the milo harvest. The next stop for Alex will probably be Chappell, NE, and he said there are already some combines going in that area. However, it seems like there is a shortage of harvesters on the run this year. Alex said that they haven�t really seen many other cutters in the areas they have been in, and that there is still a lot of standing wheat in the Dodge City area. These are from Alex. This is what happened to him yesterday when they were bringing the machines from the country into Alva to load them to move to Dodge City. The road had washed out below the surface. The same thing happened with a semi behind Alex on another bridge. They no more got into Dodge, got the machines unloaded, and went straight for the field! They can only go 1.8 MPH in the wheat they are cutting now. Fixed the side panel on the grain cart that was layed over earlier in the harvest already. It took about 6 hours. We then moved about 10 miles and tried it. The sample tested at 12.5% moisture but only 50lbs for the test weight since it had all the rain now and the freeze damage from earlier. We would have kept cutting but the farmer said he's going no-till so he doesn't want any tracks so we'll have to wait until the ground dries out enough to hold us, so probably late tomorrow afternoon or even Wednesday. These are pictures from another guy on the crew. Albums 1 and 2 are from Valentine, NE. Album 3 is some pictures of some mud they found. Another rain day. Woke up and went and fully serviced machines and fixed any repairs we had. Ate lunch at the Wolf's den and then came back to the motel. We might try to cut some seed wheat tomorrow morning. Only time will tell I guess.... we'll just hurry up and wait, again. We slept in and then did some laundry and then tried to go clean machines to move to Dodge City but got rained out again. We'll wait until the morning and see if we get more rain to decide if we'll pull out or wait. I guess tomorrow (6-16) will tell us more about our short future. Recooperation from the rain day before and more rain in the forecast so we'll just sit in our boat and wait for the great flood the way it looks. Luke decided to move to Perryton, TX and cut his 3,000+ acres instead of waiting for Alva to dry down. Tom will move his machines to Perryton tomorrow to join Luke and they will probably cut there until it's time to move to Kingsville the way it looks. The milo crop should be ready about the 1st of July. Full rain day and day off. Finally got caught up on sleep and laundry so we're good to go for another few days. Again more rain in Caldwell, so when we move it'll be to play in the mud. Rain day again... we cut 120 acres today before it started raining but the outlook doesn't look good at all. More rain in Caldwell so who knows what the plan is. Started at 2:30pm finished our ~150 acres left... but we were told by the farmer about another 160 and 80 acre patches he forgot to tell us about earlier. So we moved to the 80 and started on it. It rained in Caldwell again so who knows when we'll move there. Well it never fails the first rain day of the year when we get down to only 150 acres.... but We're gonna go try it about 2pm and see what we can get accomplished, hopefully it'll go but who knows. Alex said he has about 100 pictures so far, but hasn't had a chance to download them yet. Only 150 acres left for the crew I'm on then on to Caldwell. We have 3 combines again so it shouldn't last long, but 40% chance of rain tonight. 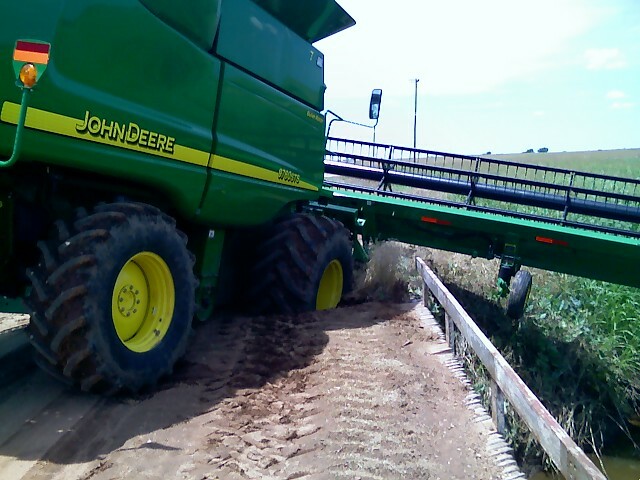 One of the new 1194 grain carts tipped on its side after it sunk in a mudhole. No pictures sorry but I'll try to find one. Started again about 10 am. Machine #9 left to help the other crew. We have 2 combines left. #1 machine blew the rotor speed controller so it will have to be fixed before it can be ran. Header #11 the reel blew apart and messed up. It will be fixed. Started today around 10:00am. We cut about 500 acres with our 3 machines (7,8,9). The wheat so far is averaging about 30bpa. We started cutting for real around about 2:30pm. We have 5 combines running together in the field. We cut around 300 +/- acres total today after poking around in the morning. Machine #2 with a 635F blew the drive pulley on the flex header and the belt. Alex joined his crew (Danielski's from Valentine Nebraska) yesterday afternoon around 5:00 at Greensburg, Kansas. This will more than likely be his "final run". They are cutting around Avard/Alva Oklahoma. Just got off the phone with him this evening and they are running all 12 machines. I am unsure what time they got started this morning by the time they got their paper work finished, and the game planned lined out. Alex said the wheat that he had cut today, was making 29 bushels to the acre average, and the moisture was at 11.3. Arrived around 6:30. We started setting up machines and unloading the others as they arrived. We are staying at the Ranger Inn. I leave June 5th (Tuesday) for Alva. 12 machines again, 10 new drapers, 2 '06 635F flex headers. 4 30 series tractors (8430 I believe) and 3 new 1197 Brent grain carts and one '06 1084 Brent grain cart. The usual red Peterbuilts with cornhusker trailers and several owner/operator leased rigs running with us. The crew only returns 4-5 guys from last year I think. I got my seasonal CDL this year. The wheat around Alva is ready, just need to wait for the ground to dry. The wheat all the way through KS is already turning as well so the harvest could be a difficult year if everything is ready at the same time, plus battling rains and not being able to move. 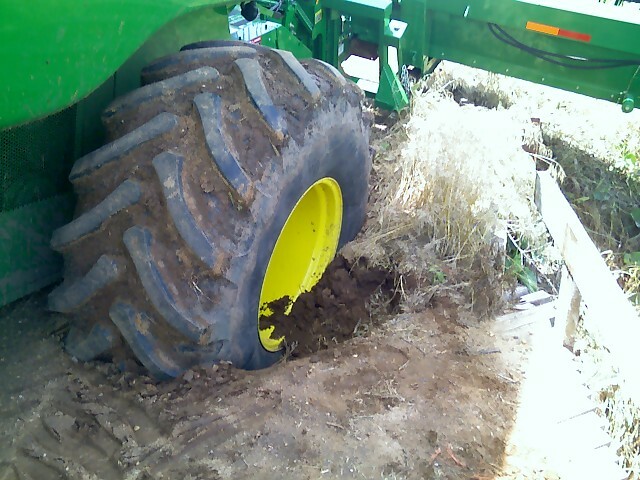 I'm afraid it may come to us putting duals on all our combines to help us battle the mud. Who knows.